The Union Steward is probably the most recognizable and one of the most important positions within the labor movement. The Steward is a vital link between the members, our Local Union and management. 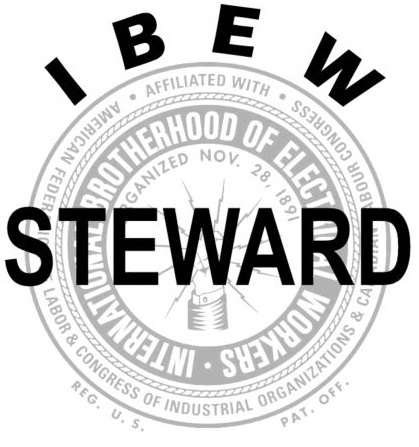 To many members, the Steward is "the Union" and their relationship with the Steward will have significant influence on their view of the IBEW. Through their actions, attitude and approach the Steward will be the IBEW that our members remember. Therefore, it is critical that the image and reputation put forward by the Steward is one worthy of their trust, confidence and respect. The Steward is appointed by the Business Manager to serve as a "front line" representative of the Local Union. In accepting this position the Steward assumes a leadership role in their workplace and will also become an ambassador of the Union who sparks the enthusiasm of their fellow members and helps to develop their sense of team spirit and belonging. Our members will most often turn to a Shop Steward when seeking advice. In order for their opinions to be valued, the Steward must be familiar with several documents including: the IBEW Constitution, Local Union 40 bylaws, their Collective Agreement, workplace policies and practices and any relevant legislation. Above all, the Steward must be a fair and objective advocate for all members in their workplace. - Is able to resolve conflict and be recognized as a good problem solver. - Is seen as an honest and credible person with high integrity. - Is assertive (not aggressive) and decisive and has the ability to deliver difficult (even if unpopular) news. - Is recognized and respected for possessing a strong work ethic. - Is committed to the principles of justice, equality, security, fairness and democracy. - Is compassionate and is able to develop a rapport with the members. - Will make members feel comfortable and provide them with supportive encouragement. - Has well-developed communication skills including the ability and willingness to give your undivided attention. - Is thorough and well organized. - Is positive, motivated, enthusiastic and an energized supporter (and promoter) of the Union. - Supporting and cooperating with the Business Manager and his appointees, and never working in conflict with them. - Building solidarity and promoting harmonious relationships among the members and discourage factional bickering in the workplace. - Getting to know the IBEW and Local 40 including understanding our history, structure, mission and role within the labor community. - Ensuring that all members are abiding by the rules set forth in the IBEW Constitution and Local Union 40 bylaws. - Ensuring that the employer is satisfying the obligations defined by the Collective Agreement and/or any applicable legislation. - Attending and actively participate in union meetings. - Encouraging members to attend meetings and (when asked) offer a brief report on the issues discussed at the meeting in such a way that those who didn't attend will recognize their importance. - Reporting to the Business Manager the successes and challenges you have faced. - Defending your Union from harmful rumours. - Promoting and maintaining a positive, professional and proactive relationship within the Union and between our Union and management. - Investigating and responding to members concerns in a timely fashion. - Gathering necessary research materials to support negotiating committee. - Learning from your fellow members by asking for their advice because their knowledge, strengths and experiences may help you to help others. - Maintaining open lines of communication with the Chief Steward, other Stewards, Officers, members and the Business Office. - Performing other duties as assigned by the Local Union or as required by the IBEW Constitution and/or Local Union 40 bylaws. - Attend training sessions offered by the Union. - Promote union building activities such as: welcoming new members; recruiting volunteers to become actively involved in union affairs or; exploring opportunities for increased membership participation. - Promote and support the "Union Label" by buying products that have been produced by Union members. As a Shop Steward, the Union has empowered you to serve as a protector of the rights of our members. Standing in solidarity with the IBEW, you will help us succeed in our efforts to enrich the lives of the working men and women within our ranks. The back bone of the labor movement and the spearhead of every battle, which will be fought, is the Steward.